I made this way back for the Super Bowl. It was so good! I served it with torilla chips, but I bet fritos would be good too. Easy and yummy! Preheat oven to 350 degrees and spray a 2 quart baking dish with cooking spray, set aside. 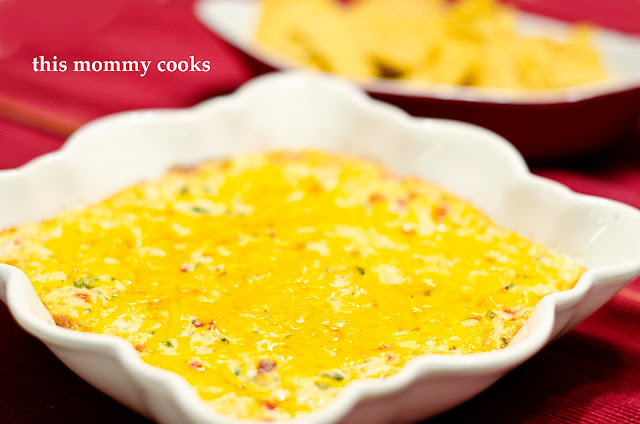 In a medium bowl add all ingredients, reserving 2 tablespoons of cheddar cheese for top. Stir well until all ingredients are combined. Spread mixture into the prepared baking dish. Sprinkle the remaining 2 tablespoons cheddar cheese evenly over the top. Bake for 20 to 25 minutes, until cheese has melted and is bubbly. Serve with tortilla chips. Yum! Can I have this for brekafast?! This would be an instant hit at our house.